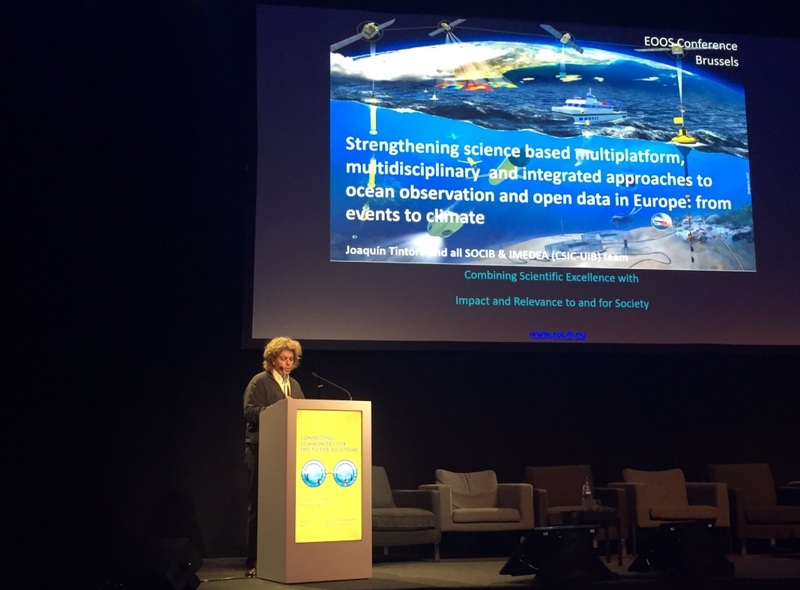 SOCIB actively participated in the European Ocean Observing System Conference held in Brussels, November 21-23. This event had provided an opportunity to bring together and connect the full breadth of stakeholder communities contributing to and/or reliant on ocean observing/monitoring activities in Europe from the scientific community, public authorities to industry and civil society. This EOOS event has co-organised by the secretariats of the European Marine Observation and Data Network (EMODnet), European Marine Board (EMB) and European Global Ocean Observing System (EuroGOOS) with input from the EOOS Steering Group and EOOS events advisory committee and with financial support from the European Commission DG MARE. Joaquín Tintoré and Emma Reyes presented the major elements of "SOCIB, a regional ocean observing and forecasting infrastructure contributing to a long term sustained EOOS" poster. Finally, Joaquín Tintoré was invited to present an oral presentation on the importance of science based, multidisciplinary and integrated approaches to ocean observation and open data in Europe with concrete examples of things that have worked well and things that have not worked very well. He gave a 20 mins talk on "Strengthening science based, multidisciplinary and integrated approaches to ocean observation and open data in Europe”. Why should Brussels care about ocean observing? EOOS conference produces Call To Action to establish roadmaps to move towards a more integrated, transparent and coordinated systematic ocean observing and monitoring approach.